Bill Shady, P.E. and CEO of Sustainable Design and Product Management and T. J. Kay, VP of Environmental Systems, will host a case study presentation series on Wednesday, October 23, 2013 from 4-5:30pm at the South Beach Harbor meeting room at Pier 40 in San Francisco. For map click here. Topics discussed will cover examples of renewable HVAC energy systems intregration with direct digital controls, solar thermal hydronic heating, CHP fuel cells for residential and commercial buildings. Hors d’oeurves and refreshments will be served and afterward attendees are welcome to join us for a Bay cruise around Mc Covey Cove in a 42′ Grand Banks fishing trawler. Parking is available at Pier 40 @ $10.00 a day– Pre-register to secure a discount parking pass. Please RSVP by Monday, October 21, 2013 to Bill@sustainabledesignpm.com or call 831-459-7300. Presentation Series: This is the first in a series of case study presentations that will cover examples of renewable HVAC energy systems integration with direct digital controls, solar thermal hydronic heating, CHP fuel cells for residential and commercial buildings. Speakers: Bill Shady, P.E. and CEO of Sustainable Design and Product Management and developer of the Climate Right System will review case studies and T. J. Kay, VP of Environmental Systems, Inc. will discuss digital controls in the Climate Right System. When: Wednesday, October 23rd, 4pm to 5:30pm. Hor d’ Oeurves and refreshments will be served. Attendees are invited to join us after for a Bay Cruise aboard a 42″ Grand Banks Fishing Trawler for a McCovey Cove hangout and viewing of the new Bay Bridge span. Transportation: Easy access on “N” Judah and “T” line. Parking: Available at Pier 40 for $10.00. Register early to secure discounted parking pass. The story behind Bill Shady's inspiration for developing The Climate Right System, a complete preassembled equipment package for radiant hydronic heating and cooling. 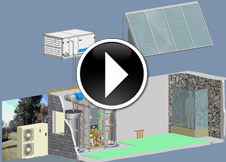 Take a tour of the Climate Right System and be amazed at what it can do.